Talislanta, by Stephen Michael Sechi, is a fascinating thing. Not just its contents, which are interesting as heck more often than not, but also its existence. It has had a long, but sometimes very difficult, history. It is an important, often unduly forgotten or ignored, part of the history of RPGs. Though most of the mainstream gaming audience has overlooked it, which sometimes seems like the plan given its confrontational counterculture attitude at times, it has nonetheless held on to a dedicated fanbase for decades, across numerous publishers. 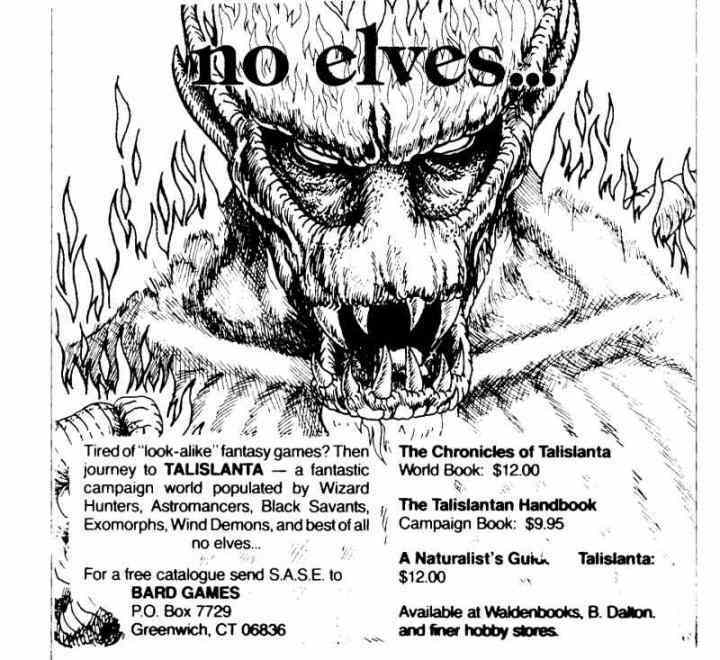 Various idiosyncrasies and unfortunate missteps with publishers relegate Talislanta to the sidelines of favorite RPG lists at least as much as the tremendous market shares of things like D&D or Pathfinder do, but it deserves to be remembered and discussed. Combining a unique setting and proprietary game mechanics across its five editions and thirty years of publication, this vibrant RPG is of tremendous interest to me, and I think it should be of tremendous interest to you. 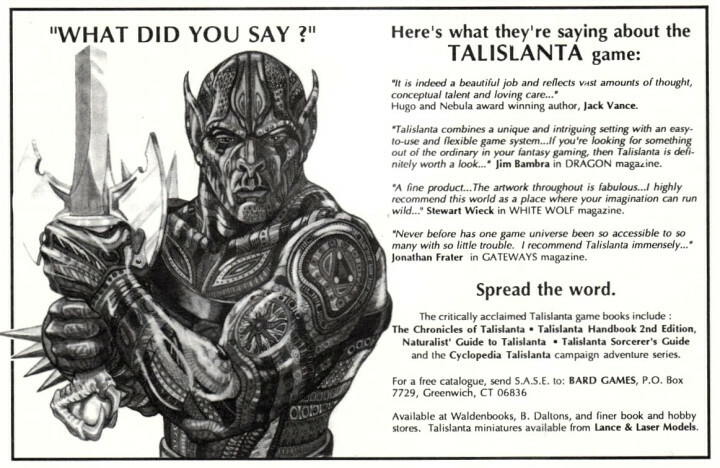 So, what exactly is Talislanta? Talislanta is a setting and a game. 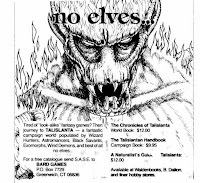 As it is written, played right out of the box, Talislanta is not for everyone. Let's get that out of the way before someone gets fussy. The game's strength comes from its variety and imagination. It revels in uninhibited creativity and things that skew a little bit weird. That same unrestrained content leads to some people disliking the "kitchen sink" feel it can give if everything is employed at once. It marketed itself as "the game with no elves" and was aggressively positioned counter to the driving force of Tolkien-inspired (and, truth be told, Gygax-influenced) fantasy that had quickly become the default basis for fantasy game settings. Its ads were very rock n' roll in their attitude and presentation, very subversive of the idea of the developing mainstream in the RPG space. 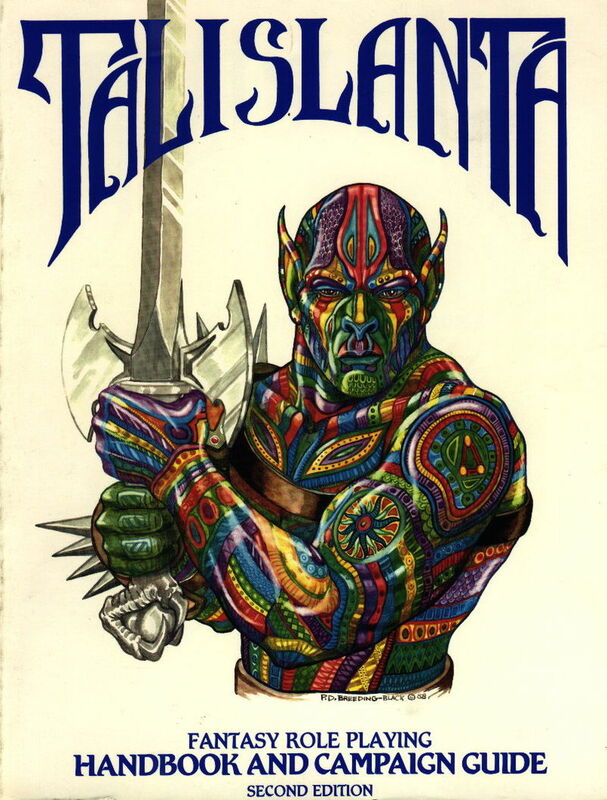 As a setting, Talislanta is a post-cataclysmic fantasy world, a place with dozens of races some of which are very much off the beaten path of Tolkeinesque fantasy. Talislanta has a boundless, lurid imagination to it. It is a place of high adventure, without much "ongoing" canon whatsoever - so the vast number of moving parts between races, territories, backgrounds, and events are free for the referee to manipulate as needed for a great game. The world is much more based on the stranger sides of science fiction and fantasy of the 50s and 60s, with plenty of Vancian Dying Earth influences and a healthy amount of psychedelia. It is filled to the brim with things a dedicated fan of Tolkien and Shannara and other such franchises might find distinctly strange and even very alien. As a game, in most of its incarnations, Talislanta has a unified action mechanic derived from a chart, one of the earliest such systems. This is predicated on the Action Table, which, with a d20 roll, resolves contests of skill or attribute as the situation dictates. Characters are derived from their backgrounds in the form of archetypes, which take race and occupation into account. Though at times it is not quite as polished as many players coming from other games would prefer (especially in the earlier versions), it is very playable. The game mechanically skews towards high fantasy, but many things in the game lean inherently toward a disregard for balance in favor of internal consistency. 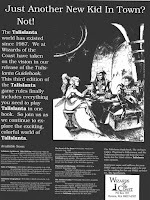 For example, Talislanta makes no real effort to ensure equality of power between the various character species and archetypes available to players. This is a good thing. As old school gamers will usually attest, it behooves us to often ignore the strict definitions of balance in most respects and benefit greatly from this choice at the table. Talislanta was made free for everyone in 2010 by Mr. Sechi, the creator, and can be downloaded from the official website. The first edition was new, wild, imperfect, and unpolished. The 2nd edition revises much of it, and makes many clarifications and corrections; it also has iconic artwork. It was, however, less polished in turn than the 3rd edition, which again revised things and smoothed things out. 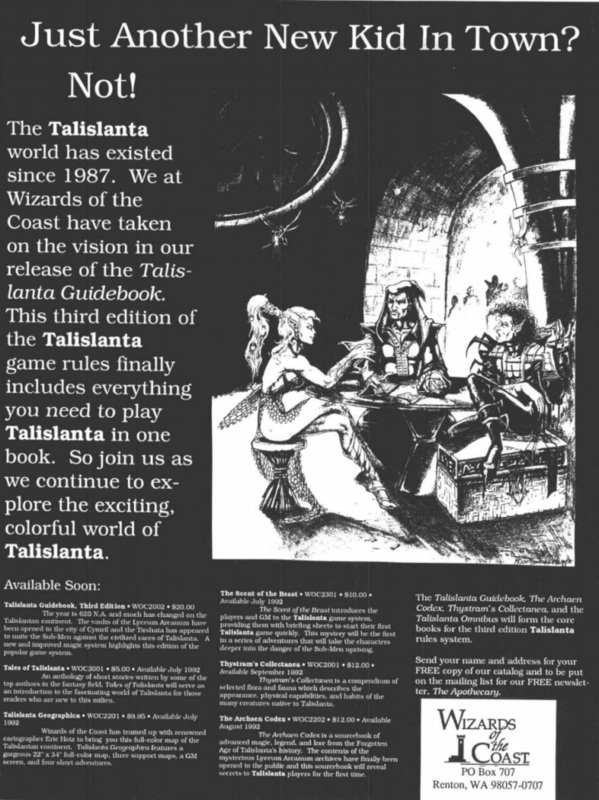 But, to fans of earlier editions, the 3rd edition suffered from being born into the narrative era of the mid-90s, so the overall feel of Talislanta as a setting in 3rd edition has a lot of changes that are annoying to many fans. The fourth edition is considered to be the gold standard by many and was adopted en masse by most of the fanbase at the time of its introduction thanks to its single-book format. The fifth edition sought to undo a few things from fourth edition and to expand options for the referee, but in so doing it split the game back into several books and introduced tons of errors and issues; despite this, excitement for what this edition did well drove many players to switch to fifth edition. According to Mr. Sechi, nowadays about 95% of players are using either 4th and 5th, and it seems like an even split between the two camps. 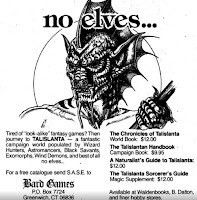 Unlike how D&D can get, however, Talislanta fans do not seem to engage in serious edition wars. Mechanically, the systems are by and large the same core ideas between all the editions. One big exception is the a change made in the 4th edition. The 4th edition ("Big Blue Book") is arguably the most comprehensive and has been compared to Rules Cyclopedia in terms of being able to do everything in the game from a single book; it was also rigorously playtested and lacks the many errors and issues of the 5th edition of Talislanta which followed. 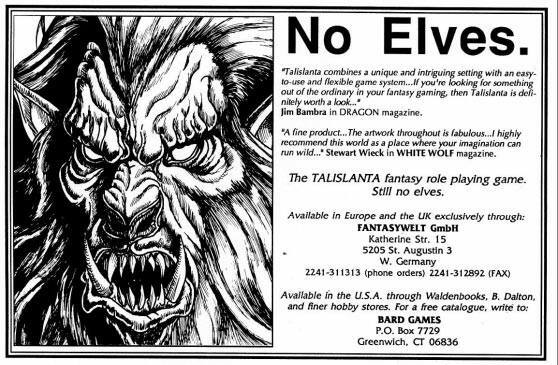 However, it has a different magic system from earlier editions, which some diehard fans feel detracts from the "Talislantaness". One of the reason 5th edition Talislanta attracted attention was for its attempt to revert the magic system towards an older design. 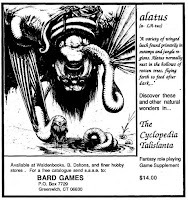 If you're thinking of actually sitting down and playing Talislanta: at the end of the day, I'd say to leaf through 2nd edition for the art and feel, and play using 4th edition. I recommend that everyone out there who is new to Talislanta be sure to grab 2nd edition no matter what (even if you don't want to play it) just to glance through the artwork. If nothing else, the raw 1970s-1980s fantasy art will inspire SOMETHING for your other fantasy or science-fiction games! 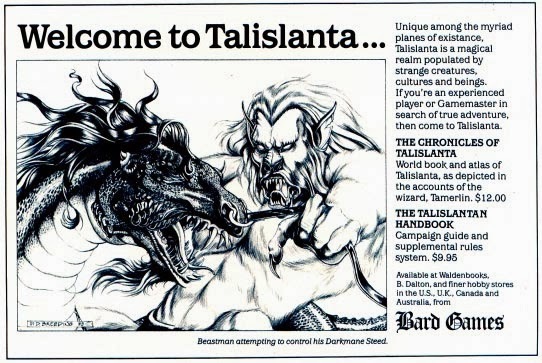 Now that we're all up to speed on what Talislanta is, you might be wondering why it should be interesting to us on what is ostensibly a D&D blog? Simply put: it's unique, it has a ton of cool stuff tucked away, and it's got thirty years of nerd support behind it providing tons of ideas and inspiration for us. Plus: it's just niche enough that a lot of your players probably won't recognize when you repurpose half the book for your next West Marches campaign. 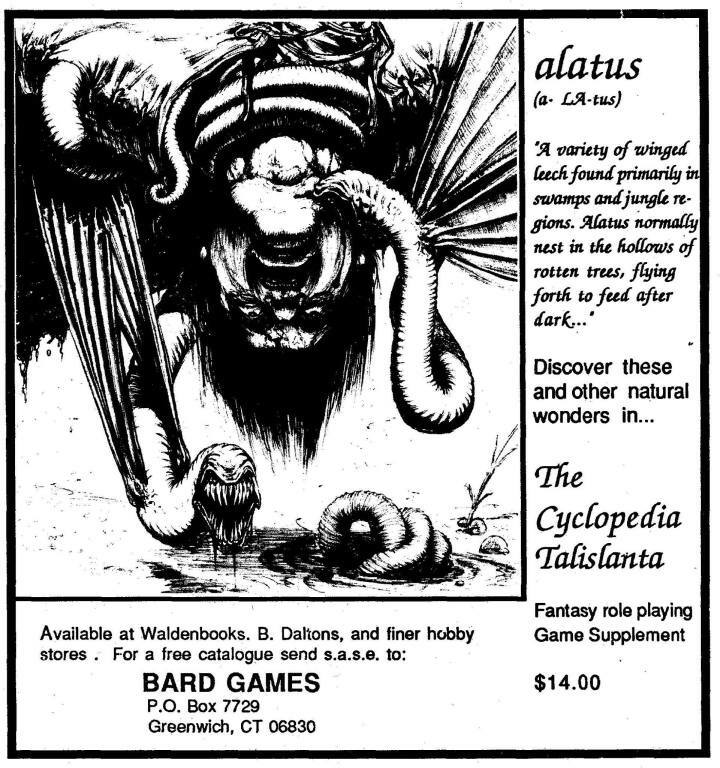 I've written before that I borrow several ideas from Talislanta in my D&D campaigns. Things like red iron, reskinned thralls, and lizard mounts are great additions to my homebrew world. There's a lot of great stuff to borrow from Talislanta for old school games (and 5e games, for those of you who visit my blog looking for that sort of thing), and I think it's time it got its due. Mr. Sechi's world was radical for its time and audience, and remains today a very imaginative and colorful thing. It is absolutely packed with cool monsters and beasts and races of people and their cultures and histories. Listing all the stuff that is neat in Talislanta that isn't found in common D&D worlds would be a full-time job of paraphrasing the body of work for quite awhile, because there's really a lot of it. Remember, it prides itself on being Not D&D. You have 30 years of stuff to read and borrow. As a side note, in the summer of last year I was lucky to get in touch with Stephen Michael Sechi and speak with him quite a bit over the course of a few weeks. I have a friend and former colleague who is quite possibly the biggest Talislanta fan on earth and I owed him a gift, so with some aid from Twitter I managed to find Mr. Sechi, who was incredibly kind and gracious. Besides being a pleasure to speak with, he allowed me to send some fancy paper over to him across the country so he could write my friend a personalized autograph, which I framed and presented to my pal. We consider ourselves even now. But in case Steve reads this: thanks ever so much for your kindness, sir! Perhaps some more grist for your mill. I have not played either, but I definitely downloaded both in entirety!! Wow, I don't think I've ever come across this before. Guess I've got some reading to do. Cheers! Hey Jeremy, I just listened! It's wild to hear my tiny little blog mentioned on a podcast. Thanks for the shout out and I'm glad you enjoyed seeing a "rarer" game get some attention here!